Washington Rotating manufactures a full line of Stripper Rubbers made of (natural) rubber, polyurethane, and butyl. The Stripper Rubbers can be custom bored to satisfy your drilling demands. We also manufacture a wide variety of Wiper Rubbers. 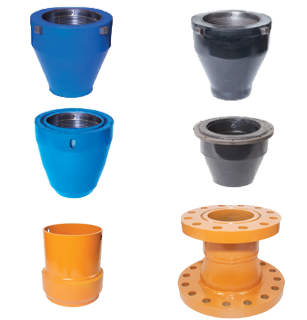 Additionally, we carry a full line of support equipment, including swedges, flanges, spacer spools, gaskets, and other accessories. We are continually evaluating our customers’ needs to create innovative and customized solutions. Washington Rotating manufactures a full line of Stripper Rubbers made of (natural) rubber, polyurethane, and butyl.